MENTORSHIP PROGRAM 2018: MENTEES ANNOUNCED! The AHWA is pleased to announce the mentees for its Mentorship Program 2018. Ronnie Smart ‒ Ronnie will be working with mentor Kaaron Warren on a short story project. Bernie Rutkay ‒ Bernie will be working with mentor Kaaron Warren on a YA novella. 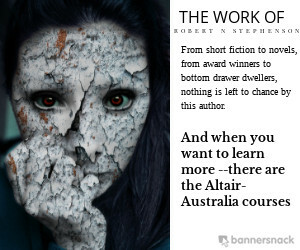 Alister Hodge ‒ Alister will be working on an action horror novel with mentor Al Baxter. Natalie Satakovski ‒ Natalie will be working with mentor Deb Sheldon on a quiet horror short story project. In addition, Helen Stubbs and Isobel Blackthorn will be working with mentor Paul Mannering to co-edit the next issue of Midnight Echo. Both Isobel and Helen were selected last year with their mentorships intended to be carried out this year. The association received a good number of high-quality applications, with projects covering a range of subgenres including quiet horror, monster horror, body horror and YA, and in a range of formats from short fiction through to novel. However, with only a limited number of mentorship opportunities on offer, places were highly contested. The association would like to thank our mentors Deb Sheldon, Kaaron Warren, Al Baxter, and Paul Mannering for the generous donation of their time and expertise. The AHWA could not run this important program without their dedication and support. Special thanks to Paul and Kaaron for allowing us to expand the programme by working with two mentees. The Mentorship Program runs from now until the end of the year. The AHWA Mentor Program offers AHWA members the opportunity to learn more about their craft and improve their skills by working one-on-one with a mentor for a set period. The things a mentee can learn in a mentorship can range from pitching a story idea, drafting a novel or publishing an e-book, depending on the available mentors in the program. Mentoring is a two-way learning experience, benefitting both parties in a variety of ways. The benefits can be personal: for the mentor, the ability to pay it forward, or for the mentee, a bolstering of confidence, or getting a piece of work to a higher standard. There are many benefits, and each mentorship will experience different things. The greatest gifts an experienced industry professional can give (as a mentor) is their time and expertise – to share the things they have learned. A mentee will get the most benefit from the program by carefully considering feedback, communicating in a timely fashion, completing any exercises set, and respecting the Mentor’s time by not making excessive demands. The more a mentee puts into their mentorship, the more they will learn. Details of the mentors and the mentorships available are listed at the end of this document. All information submitted to the Mentorship Convenor is confidential and will only be used to match mentees with mentors in the AHWA Mentor Program. The program is only open to financial members of the AHWA; committee members are eligible to apply. Application is free. The cost to the Mentee is $175.00; $150.00 is forwarded to the Mentor as an honorarium, and $25.00 goes to the AHWA as an administration fee. This is not a paid position for the mentor; the honorarium payment is not representative of an hourly rate and is only a token payment. Once the mentorship is confirmed, payments will be received/made through PayPal. Mentees can only apply for the program during the open period. Mentees can apply for the AHWA Mentor Program by filling in an application form, and where specified, by also providing a sample of their writing, artwork, or other details as requested. Once submissions are closed, the reading period will take approximately four weeks. This program has limited places, and not all applications will be successful. Applicants are encouraged to reapply in the following years’ programs. At the conclusion of the reading period, the mentors will advise the convenor of selections, and mentees will be contacted with offers. If an applicant declines, the mentor will choose another mentee who will be offered the mentorship. Submission requirements for successful applicants will vary depending on available mentors. Once all offers are accepted, the Mentorship Covenor will advise the successful applicant how to pay via PayPal. Once the payment of $175.00 is confirmed, the convenor will introduce the mentor to the mentee, and the mentorship will commence. Payment will be made to the mentor at the beginning of the program. Experienced professionals, whether they are writers, artists, publishers or poets, can act as mentors in several ways. They can offer encouragement, advice and guidance, helping a mentee to improve their craft. Or, they can offer advice in general, perhaps on how to pitch a project to a publisher, finding the right market or how to write a query letter. Sometimes they can offer a little of both things. The mentorship is only for a limited amount of time, so it helps if the mentee is very clear on what they would like to work on. Participation in the program does not guarantee a mentee’s work will be accepted for publication. A Mentor is not a teacher. They won’t correct or mark work, but they will give feedback to help you improve your craft. A mentor guides you towards your goal, but it will be up to you to get there. Time is limited so it is useful to have specific questions or areas you wish to work on in mind. If there is something niggling you about your writing, make sure this is one of the first things you ask. The program convenor will check in with both the mentor and mentee to see how things are going around the midway point. At this check-in point, the mentor will be sent a mentee evaluation, ready to start compiling for the program’s close. At completion, the mentor will be asked to write a short evaluation for the mentee, and the mentee will be asked to provide a testimonial about their experience for the AHWA to use for promotion purposes. A feedback request will also be sent to both parties. ALAN BAXTER is a British-Australian author who writes supernatural thrillers and urban horror, rides a motorcycle and loves his dogs. He also teaches Kung Fu. He lives among dairy paddocks on the beautiful south coast of NSW, Australia, with his wife, son, dogs and cat. He’s the multi-award-winning author of several novels and over seventy short stories and novellas. So far. Read extracts from his novels, a novella and short stories at his website – http://www.warriorscribe.com – or find him on Twitter @AlanBaxter and Facebook, and feel free to tell him what you think. About anything. Alan is interested in novel, novella or short fiction projects in horror, dark fantasy, crime and noir. Deb is interested in novel, novella or short fiction projects in horror, dark fiction, crime and noir. Kaaron is interested in novel, novella and short fiction projects in horror and dark fiction.